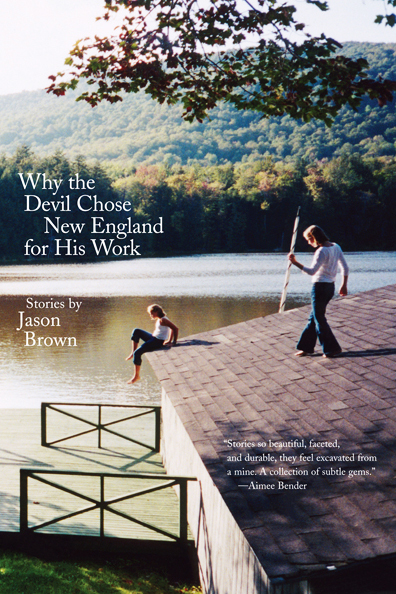 Award-winning fiction writer Jason Brown's Why the Devil Chose New England for His Work is a linked collection of beautifully haunted, violent, and wry stories set in the densely forested lands of northern New England. In these tales of forbidden love, runaway children, patrimony, alcoholism, class, inheritance, and survival, Brown's elegant prose emits both quiet despair and a poignant sense of hope and redemption. These vivid accounts of troubled lives combine the powerful small-town family drama of Andre Dubus and Russell Banks, the dark wit and calamity of Denis Johnson, and the New England Gothic of Nathaniel Hawthorne. Jason Brown’s exquisitely crafted second collection establishes him as one of the most important voices in American short fiction. "In this fine story collection, the inhabitants of Vaughn, Maine are stalked not by Stephen King horror but by intimate afflictions of blood, accident, and history. Yet their stories are too vivid to be entirely bleak. Maine's woods and rivers, its changing light, are the beautifully rendered constants in a harsh, even malevolent, world." "There's an unnerving, hazy human darkness that Jason Brown explores so well in these stories, all set around a small Maine town full of weary, complicated souls. Often Brown fixates of those just entering adulthood, an age when the twin forces of temptation and regret are most potent." "[Brown] has a gift for crisp, angular sentences, some of which are embedded with a quiet humor . . . What pushes the book far beyond sturdy realism, though, is its eerie grasp of the tensions between people and their assumptions (often wrong-headed) about each other. Like Nathaniel Hawthorne, Brown is fascinated by the shunned citizen, but here the clashes are not dictated by religion so much as faulty suspicion." "Like Joyce Carol Oates and Stephen King, Brown tells tales that are a morbid pleasure for those fond of both schadenfreude and horror stories. The perverse thrill of Brown's stories . . is that they fail to trace a redemptive arc between failure and triumph, and they rarely pair kindness with gratitude. Instead, they treat human cruelty and shame, and they show that absolution should be sought, but not given." "Readers of Jason Brown's newest collection will revel in these stories set in a single Maine town. Bordering on allegory, they offer a timeless look at the ways people confront bleak circumstances. Like the work of Nathaniel Haw thorne, Brown's sto ries render the Gothic mysteries of Maine's forests, homing in on psy chological evils rather than the de mented horrors of Stephen King. But as Sherwood Anderson did in Winesburg, Ohio, Brown also captures the pulse of rural life and its small, hidden disturbances." "An inchoate evil is hard at work in each of these eleven stunning, loosely linked stories . . . Brown’s deep sympathy for his flawed characters endows these polished shorts with brilliant appeal." 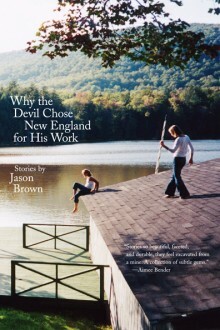 "Why the Devil Chose New England for His Work links gem-cut stories of troubled youths, alcoholics, illicit romances, the burden of inheritance, and the bane of class, all set in the dense upper reaches of Maine, and delivers them with hope, heart, and quiet humor." "The struggle is between a coercive imagination and decency. That Brown presents these themes with such intelligence and conviction suffuses his writing with a sense of integrity. Imagine The Virgin Suicides within an ethical framework. These are stories that truly have some weight to them." "I've long considered Jason Brown one of the country’s best short-story writers, and this brilliant new collection confirms it. These beautifully crafted stories are muscular and illuminating, heartrending and haunting. Brown’s voice and vision are fiercely original and wickedly satisfying, like a reader’s answered prayers." Jason Brown grew up in Maine. He received an MFA from Cornell and was a Wallace Stegner and a Truman Capote Fellow at Stanford University. He has won numerous fiction prizes and his work has appeared in publications such as The Best American Short Stories, Harper's, Open City, The Georgia Review, TriQuarterly, and The Atlantic. His first book was Driving the Heart and Other Stories. Monday, November 19, 2007, 7 p.m.
Monday, November 26, 7 p.m.
Wednesday, November 28, 7 p.m.